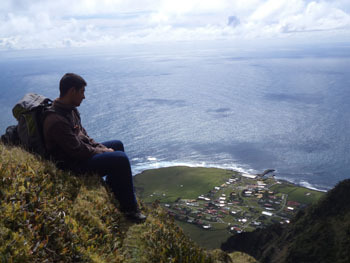 Photographs taken on 25th September 2015 during a climb up the mountain to Queen Mary's Peak on the summit of Tristan da Cunha island. 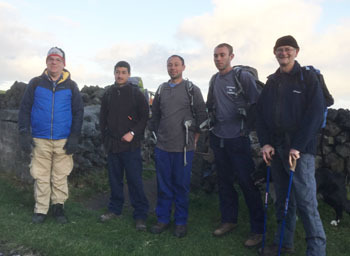 On Friday 25th September 2015 Agulhas visitors Trevor Reynolds and Andrew Finnimore climbed to the top of Tristan da Cunha's mountain - the 6760 feet high Queen Mary's Peak. Their local guides for the day were Matthew Green, Wayne Swain and apprentice guide Riaan Repetto. By 10am the group had ascended the steep cliffs behind the village on the Goat Ridge side of Hottentot Gulch and begun the steady climb of the wide ridge west of the same gulch. 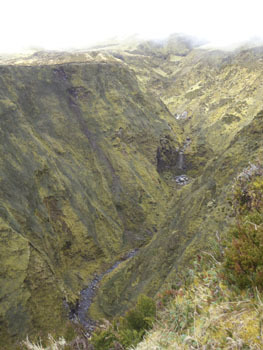 This view is taken above the zone of bog ferns where grasses dominate the landscape at about 4000ft above sea level, with the cloud base at about 5000ft above. 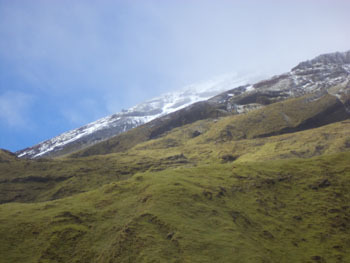 The peak cinders are covered in snow and generally in the mist of cloud. 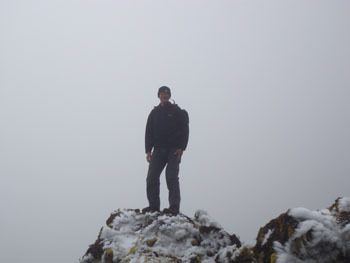 Unfortunately the group abandoned climbing right to the summit in poor weather conditions. This photo was taken at about 5000ft as the group reached the lower peak cinders as the mist closed in at 11am after four hours climbing. Above: By 1pm the group was out of cloud and well down the ridge. This view at about 4000ft above sea level looks down into the sheer-sided upper valley of Hottentot Gulch looking towards the peak. Many such gulches radiate from the central peak, so that traversing the middle base is very difficult and dangerous. However a climb along one of the parallel ridges is straightforward in good weather, for those fit enough. Left: A welcome pause at 2pm at the top of the Goat Ridge at about 2300ft above sea level, offering the wonderful view of the Tristan Settlement of Edinburgh of the Seven Seas below.